Kangaroo attack: How to protect yourself from a hopping, kicking, clawing beast. How Do You Defend Yourself Against a Rampaging Kangaroo? 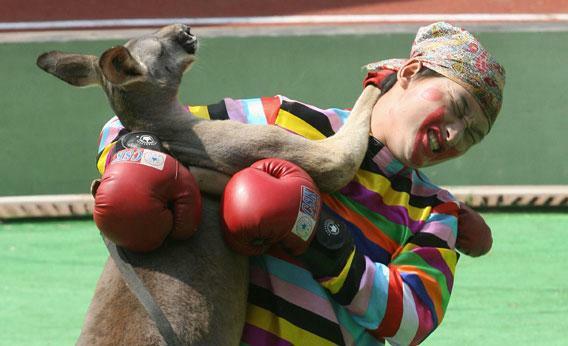 An Australian kangaroo boxes with a clown during the 2006 Animal Olympics. Please don’t try this at home. Three kangaroos escaped from a zoo in Germany this week, after a wild fox and a wild boar breached their enclosure fence from the outside. The kangaroos were recaptured without incident, but the breakout allows us to revive an Explainer minitradition. We’ve explained how to respond to attacks by mountain goats and wolves, but how do you defend yourself against a kangaroo? Walk away sideways. Although the last recorded death came in 1936, there have been several kangaroo attacks in Australia in recent years, some resulting in serious injuries. (In many cases, kangaroos have attacked humans after a confrontation with their dogs.) The best defense is to keep a safe distance and try to create a barrier between yourself and the beast. Even holding up a large tree branch can be helpful. If the kangaroo approaches, turn your body sideways, exposing a narrow profile to the animal and protecting your face and organs. Raise your hands and lean your head away from the animal to minimize the chances of being scratched across the face by the kangaroo’s nasty claws. Retreat, but do not turn your back and run. A kangaroo can easily chase you down, kicking as it hops. Special instructions apply if the attacking kangaroo is a male displaying dominance behavior, such as rearing up high on its hind legs, arching its back, repeatedly tensing its muscles, pulling up clumps of grass, rubbing its chest on the ground, or shadow boxing. That means the animal considers you a threat to his territory or female brood. Act submissive: Crouch down, avoid eye contact, and back away. Swallow your pride and let out a short, low cough or grunt—that’s how kangaroos admit inferiority to a more powerful male. Females are smaller and somewhat less formidable than males, but attacks by female kangaroos have also caused grievous human injury. If the animal insists on a fight, your best move is to curl up into a ball and wait for help. Kangaroos are vegetarians, so they typically attack humans only if they feel threatened or are convinced you’re withholding food from them. (The Australian government urges people not to feed kangaroos, but some of the animals have come to expect food from humans.) You don’t stand much of a chance in a toe-to-toe standoff with a rampaging kangaroo, which can swipe at you with clawed hands or deliver powerful kicks to your abdomen while supporting itself on its tail. A kangaroo’s foot claws are sharp enough to slice open a human abdomen. You may have seen grainy footage of 19th- and early 20th-century boxing matches between humans and kangaroos. (The earliest known boxing film was the 1896 short “Boxing Kangaroo.”) These peculiarities should not encourage you to try your hand against an attacking kangaroo. Boxing kangaroos were trained, often from a very young age, to participate in those ritualized encounters. Fighting a wild male kangaroo is an entirely different proposition—a battle with a powerful animal that may think it’s struggling for its life. Boxing kangaroos also wore gloves to protect the human pugilist from their claws. And, in most cases, the kangaroo still got the better of a human opponent before handlers came in to bail out the loser. Even trained kangaroos aren’t above fighting dirty: Many of the man vs. beast matches ended when the kangaroo delivered an unexpected kick to its opponent’s groin.